It was another beautiful weekend for a beer crawl here in Seattle. With crawls to Capitol Hill and West Seattle already in the books recently, we set our sights on the Phinney Ridge and Greenwood neighborhoods, with a start down the hill in the NE corner of Ballard. We were blessed with some beautiful weather for most of the crawl, and we got a good walk in on this one in addition to the drinking. 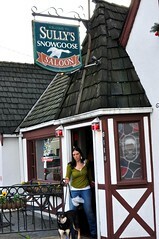 We started off at the Barking Dog Alehouse, a neighborhood bar on an unassuming street in a quiet corner of Ballard. The vibe at the Barking Dog was laid back with a few locals grabbing brunch and bloodies around noon on this Saturday. It’s an attractive place that would be a welcome spot for after work drinks, and the menu looked enticing enough for lunch and dinner. 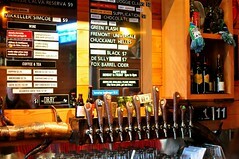 Their tap list had a nice mix of Belgian ales and NW craft beers, and there were plenty of interesting choices. I began the drinking with a Big Al Belgian Brown Ale, which turned out to be one of my favorite beers of the day. I also sampled the Fremont Little Woody, an oak-aged version of their Universale Pale Ale. Next up was a short walk down the street to The Dray, which has put its name on the list of great Seattle beer bars since opening in 2008. It’s a pretty tiny place, but I can’t think of a much better spot to grab a beer on a sunny afternoon when they have their windows and door open. Their beer list was stellar, as always, with offerings like the De Proef/Bells Brewing collaboration, called Van Twee, Green Flash IPA, Chuckanut Helles, Hair of the Dog Doggies Claws and Russian River Supplication. There were a couple of people sitting around watching some English soccer and sipping on pints, which is a pretty common sight around the Dray. This is a popular place to watch football/soccer, and you can see the schedule of games they’ll be showing here. If you still haven’t taken the time to check this place out, I’d suggest heading over ASAP. Next up was a well-earned visit to Sully’s Snowgoose Saloon after walking up a sizeable hill to the top of Phinney Ridge; I’d say we burned off a beer from the Dray with that one. Locals likely know Sully’s well, but most of the people on our crawl had never visited the bar previously. If you’ve driven down Phinney Ave before, there is a good chance you’ve seen the building though. From the outside, it looks like a lodge stuck in some little town in the Alps. From the inside, it’s a cozy bar with a super-laid-back vibe that matches the outside to an extent and a solid selection of beers. It was fairly busy with friendly regulars that were happy to talk us up a bit. The tap list was solid, and I ordered myself a Bridgeport Hop Czar and then regretted it a little once I saw they had Boundary Bay IPA on the cask engine. I enjoyed the Hop Czar along with a few others from our group, but there were a few of us that weren’t fans of it either; we were split right down the middle on that one it seemed. The patio outside looks like a perfect place to sit for a few hours with beers in nicer weather, and I’m really jealous of people that have this place as their local. We timed it perfectly and hit the Park Pub directly across the street when they opened at 3pm. I’d been there just once before, and on that visit I’d told myself I’d come back. Well, it only took me a couple of years. The bar itself is nothing special, but it seems like a fine place to do some drinking for an extended period. Their tap list was pretty impressive for a such an under the radar place. My favorite was the Boulevard Tank 7 Saison, which was a really enjoyable (but strong at 8.5% ABV) take on the style. Other offerings included Deschutes Jubel 2010, Lazy Boy Whip Ale, Snipes Mountain Porter, Big Time Bhagwan’s Best, and Lagunitas Hairy Eyeball. We all got a bit of a kick out of what seemed like a running/jogging pub crawl that visited while we were there that was kind of the complete opposite of our drinking-focused group. We jokingly threw around the idea of running off with them to their next destination, but figured at least half of us wouldn’t make it wherever they were going. With four bars already ticked off for the day, we walked a few blocks up Phinney to the popular 74th St. Ale House. Along with the Columbia City Ale House (which Jeanne and I visit occasionally since it is near us) and the Hilltop Ale House, the 74th St. Ale House is a perfect corner bar for your neighborhood for when you want consistently good beer and food. All three of these Ale Houses are very similar in inventory and atmosphere, and if you’ve visited one of them then you probably need not go out of your way to visit the others. They always have a solid lineup of beers, but they do not rotate many taps and they stick to what seem like safe, high-turnover beers that appeal to a wide audience. Once again, I’m not saying the selection was bad; not even close. It’s just not exactly exciting. I enjoyed my pint of Big Time Atlas Amber, which I hadn’t had in quite a while. They do a cask night every Wednesday here, which I’m assuming gets a crowd of people in the door. Seems like a good night to check the place out if you are going to. While about half of our group had fallen off the crawl by now to attend to other plans, the few of us that were left headed up to the stop that should need no introduction on this blog: the Naked City Brewery & Taphouse. It is no secret that Don Webb and Donald Averill did us all an amazing favor when they opened up Naked City in 2008, and it is a place that I try to get up to as much as possible (not often enough). 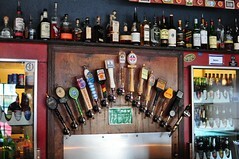 They always have a great selection of mostly West coast beer, and their dedication to their taps is unparalleled. They’ve been known to drive around to breweries in obscure corners of the state just to grab a single keg to bring back for the bar. On this visit, I was impressed by a glass of the Rogue John John Dead Guy Ale, which is their regular Dead Guy Ale aged in Rogue Whiskey barrels. I was also pleased to have my second Big Time beer of the day, this time a “Cascadian Amber” called the Big Time Ascent. After about 6 or 7 hours of walking and drinking, the more intelligent members of the crawl convinced me that it was time to call it a night. We had tentative plans to include Pillager’s Pub, the Baranof (every crawl should have a dive), and even the Pub at Piper’s Creek if we wanted to add another longer walk. But, hopping on the #5 to head back home was the smart call, and I’ll live to crawl another day. The six bars we hit was really just about perfect, and with the 2 to 3 miles of walking our sobriety was still pretty well in check. Overall, these crawls are making me a bit jealous for the lucky people that get to live in these neighborhoods. Big thanks to Russ and Gibson for taking photos, meaning that I didn’t have to! Sounds like so much fun! Can’t wait until I move back to Seattle and can join you all. Cheers! Nice selection of places. Sorry I missed you guys. Interesting photo from Sully’s. As far as I know, they are not dog friendly. They used to be cool about it if you had your calm, friendly dog leashed and under control, but there apparently was a bite incident several months ago, that was that for dogs. Were there other dogs there, inside or on the patio? you bumped into the seattle hash house harriers at park pub (i was amongst the pack). i don’t know if i’d say our group was the complete opposite of yours – we had a common goal of consuming a good amount of beer and being outside on a nice day. Next neighborhood to be invaded by the Pub Crawlers: Green Lake. Dang, this is almost the exact crawl I used to fantasize about. gcm – you’re right…any runners/joggers that are using bars as pit stops really aren’t too different from us! UBH – I don’t recall seeing dogs in the bar when we were there…but I could just not have noticed. Wow, I guess I really had no idea what the Hash House Harriers really is! UBH – No, Sully’s no longer lets dogs in. A true shame. Sounds like a good crawl, shame you never made it to Baranof’s. That’s not just a bar, it’s an experience.